I do my best. Sometimes, it’s not good enough. I was directly commanded by the Goddess to join Duke Harper Drunemeton—the heir of Merlin—and Lord Ron Steadbye—the heir of King Arthur—because the nuking of London is the Time Foretold. I didn’t want to leave the Motherhouse. Ever since my boyfriend died while we were climbing the Eiger, I’ve suffered debilitating panic attacks and agoraphobia (fear of the outdoors). Leaving the Motherhouse for the great wild world is absolutely terrifying. I was informed by the Leadership Committee (the High Priestess is the absolute leader of the Sisterhood, but the Leadership Committee runs the High Priestess) that I should mate with the Merlin Heir—Duke Drunemeton—to possibly produce an adept with greater powers than we’ve been able to achieve through normal methods. So now I have all these things I’m supposed to accomplish, and I just don’t know if I am up to the task. What did you first think when you met Ron? Meeting Ron—Lord Steadbye, the heir of King Arthur—totally changed everything. What is this intense attraction we have for each other? I can feel his fascination with me, too. And this in turn is upsetting Harper Drunemeton. The hell with what the Leadership says, I need to be with Ron, not Harper! The Goddess told me that Morgaine has been killing members of our families (my father and mother and boyfriend, for instance) to destroy us, and it is almost working. I have the panic attacks. Harper is completely demoralized after the loss of his wife and child. And now they are attacking us. Ron and I had a car smash into us on the way home, and the woman died—there was a strange tattoo on her arm. Someone lit my aunt’s house on fire. Someone else tried to poison us. And then they chased Ron through the streets of Cardiff. What is going on, and why is Morgaine trying to stop us from getting to London on Midsummer? What is the worst thing in your adventures? The panic attacks. I had a doozy on my way to Anya’s Sacred Grove. I really thought I had lost it for good. But then the Goddess stopped it. I know she can’t stop all of them. Being with Ron helps calm them. Ron. He is amazing! I have never felt so loved, so cherished. And wow, is he a great lover! Ifijioku is my old teacher and now advisor. She is 97, but is really the best friend I have. I think Harper and I can build a friendship—we’ll need to be close to help rebuild Britain. I wish I was closer to my sisters. But they are all older than me. My sisters felt that I was not the right one to take over our grandmother’s role as High Priestess. Others felt I was trying to be the head of the family (and I may have behaved in ways that indicated that. I tend to be bossy by nature). Anyway, we’re not close. I wouldn’t say I hate Morgaine, but I am definitely getting angry about her interference in all of our lives. I will not let her harm Ron. And I definitely want to stop her from taking over Britain. I LOVE to garden. I redid all the gardens at the Motherhouse. And I set up greenhouses so the Motherhouse is now mostly self-sustaining (we are vegetarians by nature). I love a good red wine (I’m not picky. Most reds will do). And I adore beautiful books! We have to call on Morgaine to help us heal Britain. But I have every reason to believe she’ll attack at least me. What if she succeeds? Will Ron and Harper know? Will I be killed? What will become of Britain? I think I’m pregnant. I’m happy, but now is not exactly a convenient time. Because I don’t know if I will walk out of the Sacred Circle, or if Morgaine will. Jacqueline Church Simonds is an author and publishing consultant living in Reno, Nevada with her husband and beagle. Her previous novel is CAPTAIN MARY, BUCCANEER. PRIESTESS OF ANYA, the prequel to the Heirs of Camelot series, will debut in late August; the rest of the series will come out in 2019. 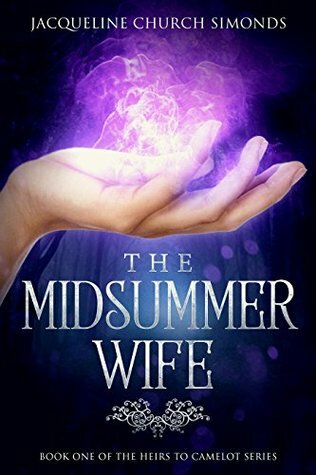 You can find Ava on the pages of The Midsummer Wife.